Using computers to read mammograms can significantly speed up the detection of breast cancer, according to research. The study found that breast X-rays scanned by a computer as well as a radiologist were as successful as those read by two radiologists. In some cases, write the authors in the journal Radiology, the new combination was even better at spotting tumours. The study by Cancer Research UK scientists uses software called Computer Aided Detection, or CAD. The program scans mammograms for any suspicious features that may indicate a tumour and then highlights the irregularities on screen. CAD technology is already available in the US and some European countries, but has not been assessed for UK breast screening. To assess the efficiency of CAD, researchers used more than 10,000 mammograms taken in 1996 that had been previously assessed by two clinicians, which is the standard method for checking for cancers. The X-rays were then scanned by CAD, and assessed by a radiologist who double-checked any areas highlighted by the computer. 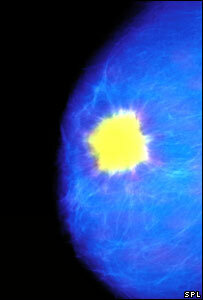 It could help manpower problems in the breast screening service. The study found that the cancer detection rate using CAD was at least as good as the traditional method, and in some cases even more successful. Professor Fiona Gilbert, a radiologist from Aberdeen University, who led the study, said: "The results of this trial are very encouraging. "We have now embarked on a new study to confirm that the CAD result is still as good when used in real day-to-day decision-making about breast cancer diagnosis." The new prospective trial will look at 30,000 women in three breast screening centres in the UK. Professor Stephen Duffy, an epidemiologist for Cancer Research UK, who also worked on the study, said: "The great advantage of CAD is that, if we confirm the very promising results of this study in a prospective trial, it could help manpower problems in the breast screening service. "The CAD system would free-up hundreds of radiologists to work on more mammograms as only one instead of two would be required to work on each X-ray." Dr Sarah Rawlings, head of policy and information at Breakthrough Breast Cancer, said: "The results of this study are very positive and we look forward to further trials which will tell us if this technique could be routinely used. "The use of new technology in addition to standard breast screening is to be welcomed, however we know that some women aren't currently attending their screening appointments. "Early detection is vital to improving the chance of survival. We advise those aged 50-70 to accept their screening invites or request a mammogram if over 70."